So, End Times: Archaon is out. This post therefore contains mild spoilers. You have been warned. Destroying the world, well, it wasn’t easy. Ulthuan, Bretonnia, Athel Loren, the Empire… They, and the world they belonged to, have been part of my life for twenty-five years, ever since I picked up a copy of Warhammer’s 3rd Edition. I’m not sure how I felt when I typed the last few words. Guilty? Possibly. It helped, of course, that it was always going to end this way – if I hadn’t written it, then someone else would have finished the story, and almost certainly in a way I wouldn’t have (writers are like that). Relieved? Definitely. I’m not really one for taking joy in watching something take shape over time. I like to see the final, tangible product of my efforts. It’s the main reason I’ve never gotten along with painting miniatures – it takes ages, and for 99% of that time, the model looks, if anything, slightly worse than it did before the undercoat is applied (at least when I do it). Archaon certainly had a larger cast than any book so far, so can I pick a favourite character from amongst the fray? It’s hard. It’s definitely hard. I’m fond of Alarielle, who I think bears the greatest burdens over the course of the story, and does so (for the most part) unflinchingly. Borrowing from the late, great Terry Pratchett, she understands that ‘personal isn’t the same as important’, and comports herself accordingly. The same can perhaps be said of Ungrim Ironfist (my brother’s favourite character, back in the day) for whom the burdens of leadership and the slayer oath are at last resolved. I also have something of a soft spot for the big man himself. There’s a sense of a fallen hero about Archaon, a man who could have been great had he not embraced Chaos. Too much pride, that’s his trouble. There are plenty of characters to like, or even to admire, but I’m going to have to choose Vlad as my favourite. Vlad von Carstein was, and remains, totally awesome. He’s a fantastic, empathic character – despite the fact he’s technically an undead villain – and he was a joy to write. A great deal of his uniqueness, of course, springs from his undying (haha) love for Isabella (romance being almost unheard of in Warhammer). The rest comes from Vlad’s outlook on the nature of power. It’d be a mistake to call him amoral. He has a morality, it’s just that it’s not quite the same as ours. ‘Humans are cattle’ is an expression that finds its way into most vampire stories, but I think Vlad’s the only one it truly fits. (Let’s be honest, the vampire/human relationship is normally more a cat/mouse one – with Buffy the Vampire Slayer hailing from the Tom & Jerry end of the spectrum). Vlad aspires to rulership, not outright tyranny – a distinction that’s lost on most of Warhammer’s vampires. I doubt his attitude springs from altruism – at least, as we understand it – but equally, I don’t think it’s entirely self-serving either. Stealing from Pratchett once again, I’d say it’s a case of ‘what can the harvest hope for, if not the care of the reaper man?’ Vlad is ruthless, egocentric and arrogant, but he understands that it is better to shape the natural order, than attempt its extermination. Rest in Peace, Vlad. If it’s any consolation, you died stealing the show. 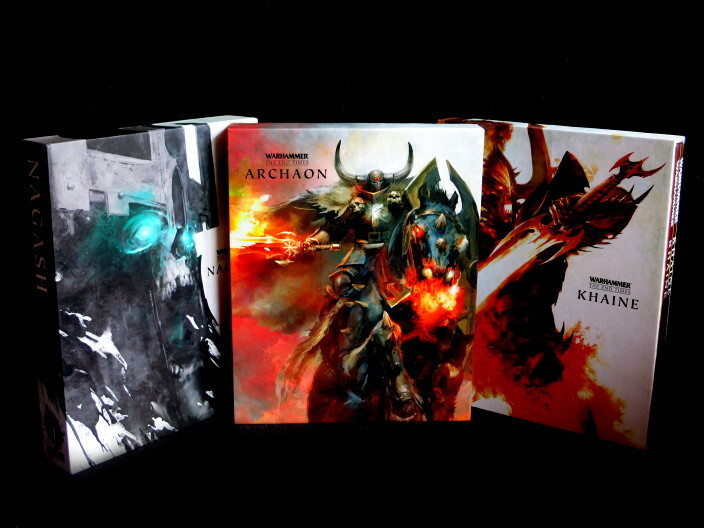 So yes, Archaon was my last book for Games Workshop (although was has an unnecessary air of finality to it, I think). It’s been fun, but to all things there is an end. That being the case, this marks my last blog on the topic of Warhammer, at least for the foreseeable future. Before I go, however, I’d like to thank not just the writers, but the artists, designers and editors who’ve helped make, not just ‘my’ books, but all the recent End Times volumes into such a fantastic series – it ain’t just about the words. Posted in Featured Blogs, Thoughts from the Tower and tagged Inspiration, Warhammer, Writing. ← Good Game, Bad Game, Fun Game?